Summer officially arrives when I take that first bite of a peach. 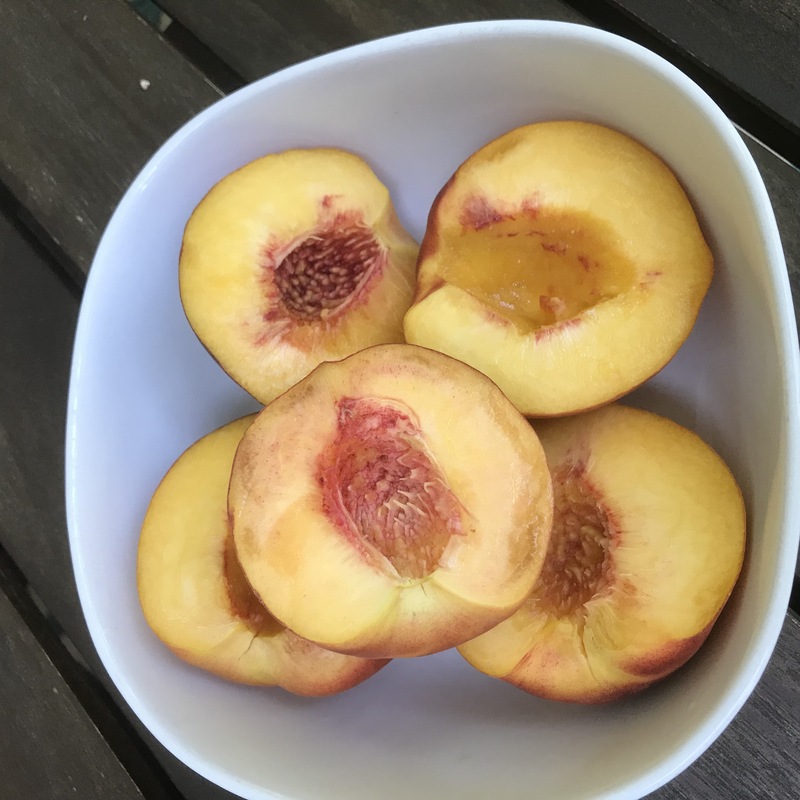 White or yellow, round or donut peaches are the quintessential summer fruit and I enjoy every bite because like so many other fruits, they are only good one time a year. Peaches are juicy and sweet – perfect for a snack or dessert, but also hold up to high cooking methods like grilling or baking. This brings out their sugars and makes them even sweeter tasting. After grilling, top it off with a scoop of coconut cream or vanilla ice cream, you simply cannot do anything but pause and take a deep breath – appreciating every. single. bite. But this fuzzy fruit is so much more than just taste. In ancient beliefs, the peach was a symbol of virginity and fertility, as well as longevity. As a member of the plum family, this fleshy fruit is cooling in nature and helps to build body fluids in the case of dry coughs. 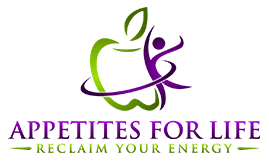 It also helps to lubricate the intestines, which promotes healthy elimination and constipation relief (which is why if you eat too many peaches, the opposite effect happens – things get a bit too loose). Nutritionally, peaches are high in Vitamins A & C and unlike most fruits, contain calcium. They are also a great source of antioxidants, which help to quench free radicals in the body. Free radicals are unstable molecules that can promote inflammation and potentially damage DNA, cell membranes and enzymes. Antioxidants are critical in fighting free radicals and the damage they create. Antioxidants are found in fruits and vegetables, which is one of the reasons why it is recommended to eat 5 or more servings per day. 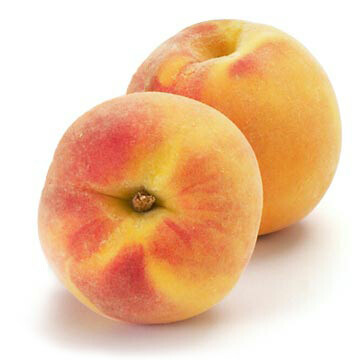 Peaches are also high in caffeic acid, which as Dr. Axe explains helps to reduce cancer risk and tumor growth as well as fight certain inflammatory molds found in other foods (https://draxe.com/peach-nutrition/). To find the perfect peach, smell it and touch it. Look for those with a nice peachy aroma (yes, actually sniff the peach) and a delicate softness that gives slightly to light finger pressure. Peaches ripen quickly, so don’t buy too many at a time, unless you are prepared to eat a lot of peaches at one time. In the kitchen, you can use peaches for a variety of dishes, or just enjoy them as a snack. One of my favorite culinary combinations is peaches with blackberries. Cut up the peach into bite size pieces, and serve with the blackberries with some ground flax seed and plain organic grass-fed yogurt for a delicious breakfast. 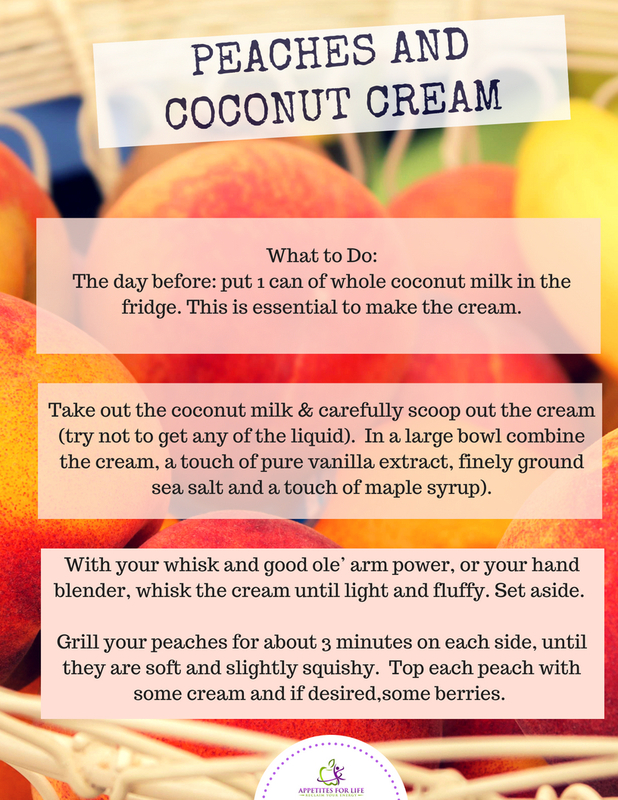 As mentioned above – grilled peaches with coconut cream is divine. Try this recipe below for the perfect summer dessert. For another great coconut cream recipe check out my Berry Fresh Parfait.